As Linux® on System z® becomes more prevalent and mainstream in the industry, the need for it to deliver higher levels of availability is increasing. IBM® supports the High Availability Linux (Linux-HA) project, which provides high availability functions to the open source community. One component of the Linux-HA project is the Heartbeat program, which runs on every known Linux platform. Heartbeat is part of the framework of the Linux-HA project. 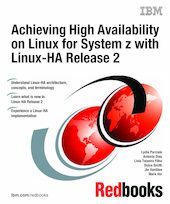 This IBM Redbooks® publication provides information to help you evaluate and implement Linux-HA release 2 by using Heartbeat 2.0 on the IBM System z platform with either SUSE® Linux Enterprise Server version 10 or Red Hat® Enterprise Linux® 5. To begin, we review the fundamentals of high availability concepts and terminology. Then we discuss the Heartbeat 2.0 architecture and its components. We examine some of the special considerations when using Heartbeat 2.0 on Linux on System z, particularly Linux on z/VM®, with logical partitions (LPARs), interguest communication by using HiperSockets™, and Shoot The Other Node In The Head (STONITH) by using VSMSERVE for Simple Network IPL (snIPL). By reading this book, you can examine our environment as we outline our installation and setup processes and configuration. We demonstrate an active and passive single resource scenario and a quorum scenario by using a single resource with three guests in the cluster. Finally, we demonstrate and describe sample usage scenarios.